Hello guys, I apologize for not posting recipes often. When I started this blog, my initial goal was to do that every other day. However, as time goes by, I find it harder to do so without getting burned out. I am a disabled mom of four kids under 6 years old, two of which are developmentally-delayed, so it is quite a challenge in my household on a daily basis. Blogging is my creative outlet and sharing my passion for food and connecting with you brings me joy. I don’t want it to become a source of stress because it will kill my creativity. So, upon honest examination of my schedule, once a week posting is suitable. If I can do more, I will gladly do so. 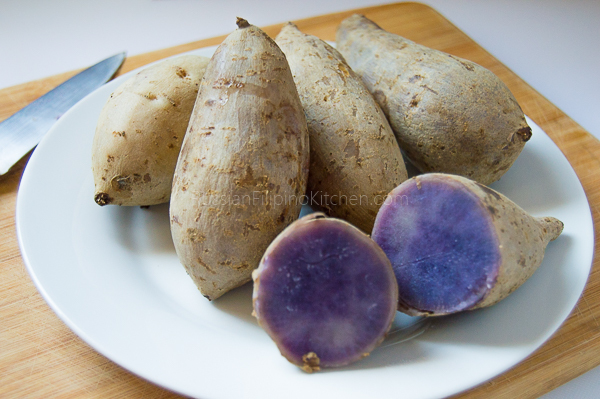 Sweet potatoes, also known as “kamote” in Philippines, are root vegetables known for its starchy, sweet flesh. There are different varieties but the common ones include those that have purple, off-white, yellowish, or orange interior. They are often boiled, baked, or fried. I love sweet potatoes ! I grew up eating them, mostly as substitute to rice or as an ingredient in some Filipino recipes such as binignit. 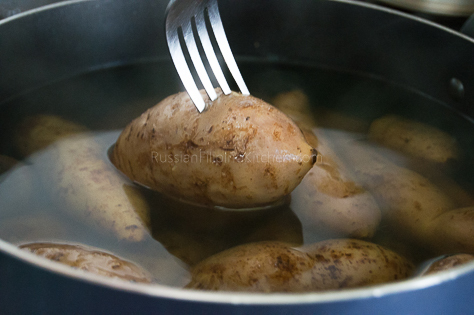 Here are quick instructions on how to boil sweet potatoes. 1. 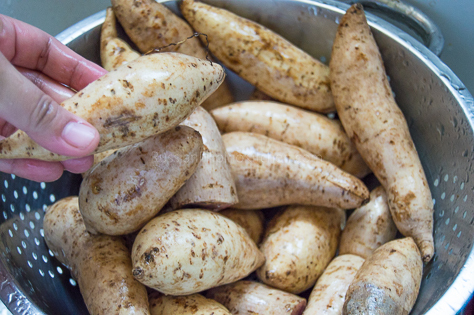 Wash sweet potatoes under cold running water and scrub off any dirt or impurities stuck to the skin. 2. Place in a large cooking pot or 5-qt Dutch oven and add enough water to cover. 3. Cover and bring to a boil over high heat, then lower heat to medium and simmer for 1 hour or until sweet potatoes are fork tender. 4. Remove from heat and drain using a colander. 5. 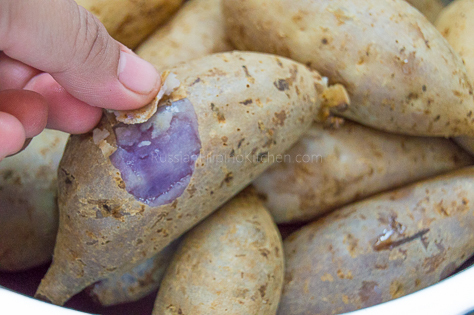 Serve warm or use in any recipe that needs pre-boiled sweet potatoes. 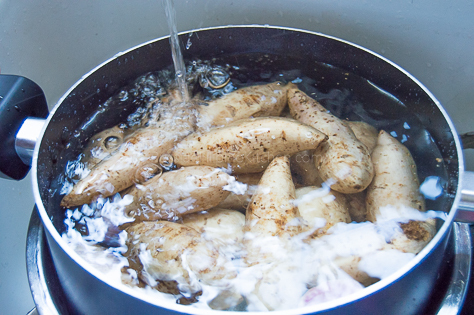 Wash sweet potatoes under cold running water and scrub off any dirt or impurities stuck to the skin. 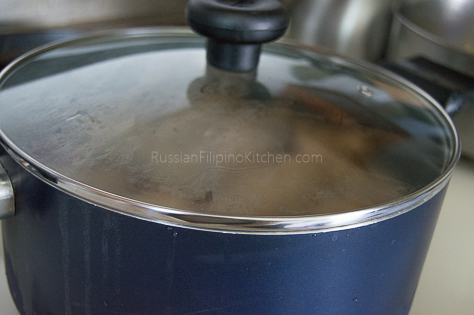 Place in a large cooking pot or 5-qt Dutch oven and add enough water to cover. Cover and bring to a boil over high heat, then lower heat to medium and simmer for 1 hour or until sweet potatoes are fork tender. Remove from heat and drain using a colander. 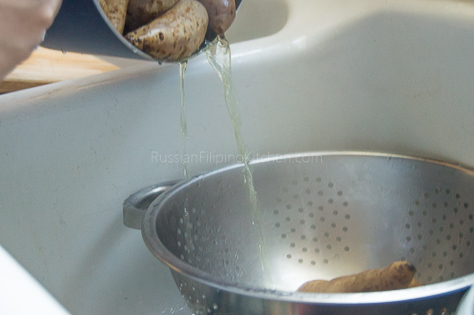 Serve warm or use in any recipe that needs pre-boiled sweet potatoes.